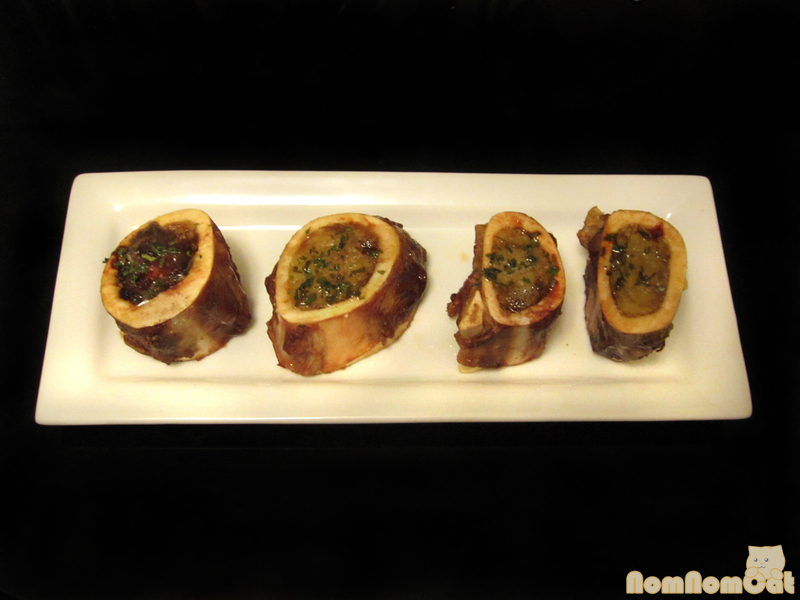 Roasted bone marrow has to be one of my all-time favorite comforting meat-treats. One Sunday as Martin and I were strolling through our local Mar Vista Farmer’s Market, we stumbled upon Dey Dey Farms, now our go-to vendor for grass-fed beef and pasture-raised chickens. The vendor stall lists their many products on a whiteboard and two words caught my eye — marrow bones. “DIY marrow?” I asked Martin. He was game (haha – no pun intended) and we selected a pound, approximately 4 cross-sections of the cow’s femur. The man behind the table told us that marrow is best consumed raw to really take advantage of its nutritional content, but I just could not resist the thought of gelatinous, rich marrow spread over toast. 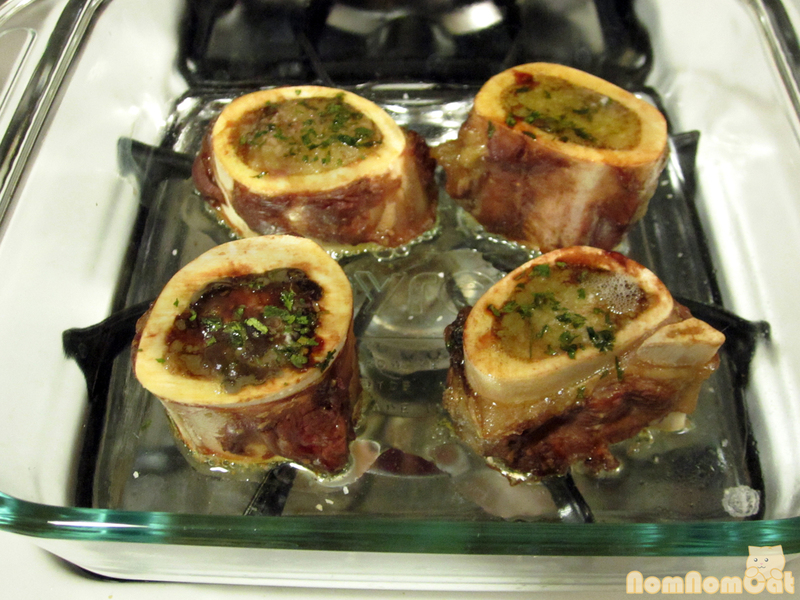 Do-it-yourself roasted bone marrow is actually quite easy, and I wish I had learned that sooner. To me, this is the perfect hearty dish for a cold winter’s night. * For a light dinner or appetizer, we allotted a half pound per person. Preheat the oven to 425 degrees. 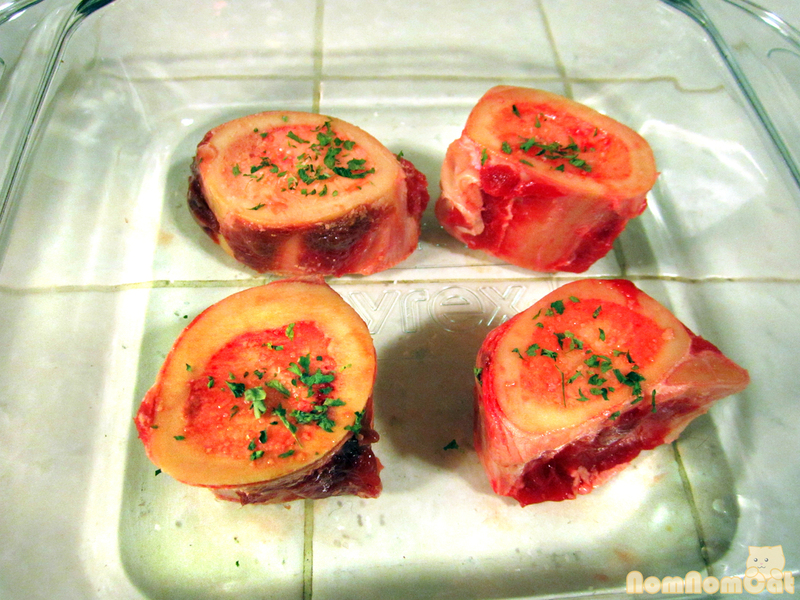 Clean the marrow bones. Some people like to soak the bones to extract the blood but I haven’t had issues with roasting them as-is. Sprinkle salt and pepper on both of the cut sides of the bones. Top with some dried parsley and roast for about 20 minutes or until the marrow middles break down into a glistening gelatin. Serve with a nice, crusty bread au naturale or slice a baguette into crostinis. Use a marrow spoon or just any small spoon to dig out the gelatinous bits and spread them on the bread for a heavenly bite. You could also whip up a lemon-dressed parsley salad, the traditional accompaniment for roasted bone marrow. For further decadence, serve a bone (or two) alongside a succulent steak! 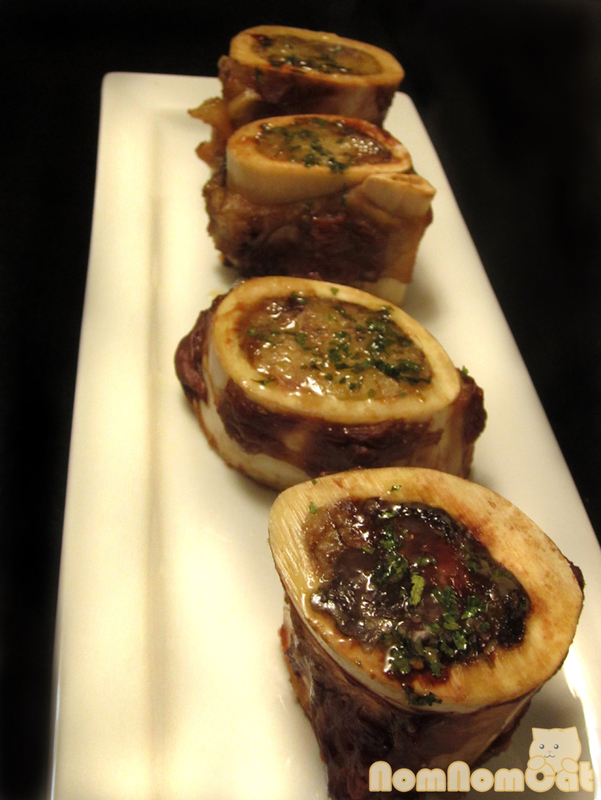 I feel like bone marrow is so decadent that it must be a crime or at least very, very naughty. Though I’ve never heard of eating raw marrow. It sounds kind of scary, but I might give it a go if the opportunity was presented to me. Though I don’t think most marrow fans eat marrow for health but for pleasure. Some argue that most of the “nutrition” is fat, which (way back in hunter-gatherer days) was hard to come by. I still haven’t tried raw marrow, but if I get the opportunity, I’ll let you know how it tastes! I went to the chinese supermarket and the butcher had a garbage bag’s worth of marrows. I asked him how much, and he didn’t want to sell it to me. No because he had a use for it…because they were going to throw it away! After a bit of back and forth he gave me four huge marrows for $1 total.Yes! Followed your recipe (adjusting the time on account of the marrow size), and…excellent! I’m hosting a small dinner gathering next week– and guess what’s on the menu?